On 15 August park rangers noted unusually high water in the Volgu River, which originates from a water-filled depression called Gengissig in a geothermal area of Kverkfjöll; the high water destroyed a walking bridge. The next day an overflight of the area by members of National Commissioner of the Icelandic Police (NCIP), the Icelandic Meteorological Office (IMO), and the Institute of Earth Sciences revealed that Gengissig was empty and that a phreatic explosion had deposited streaks of dark material on the rock and snow. The Global Volcanism Program has no Bulletin Reports available for Kverkfjöll. Kverkfjöll is a large subglacial volcano at the NE end of the Vatnajökull icecap. Two elliptical ice-filled calderas, each about 8 x 5 km in size, have been identified. An associated fissure swarm can be traced 60 km to the NE. A half dozen ridges of subglacially erupted pillow lavas are now exposed and extend beyond the glacial icecap to the NE. Subglacial historical eruptions have been recorded since the mid-17th century. Several other historical eruptions once attributed to Kverkfjöll are now thought to have originated from Bárdarbunga volcano to the west. Bjornsson H, Einarsson P, 1990. Volcanoes beneath Vatnajokull, Iceland: evidence from radio echo-sounding, earthquakes and jokulhlaups. Jokull, 40: 147-168. Gudmundsson A T, 1986. Iceland-Fires. Reykjavik: Vaka-Helgafell, 168 p.
Hoskuldsson A, Sparks R S J, Carroll M R, 2006. Constraints on the dynamics of subglacial basalt eruptions from geological and geochemical observations at Kverkfjoll, NE-Iceland. Bull Volcanol, 68: 689-701. Johannesson H, Saemundsson K, 1998. Geological map of Iceland, 1:500,000. Tectonics. Icelandic Inst Nat Hist, Reykjavik. Sigbjarnarson G, 1988. Krepputunga and Bruardalir--Explanatory Text to Geologic Map. Reykjavik: Orkustofnun OS-88038/VOD-06, 44 p (in Icelandic with English summary). Sigurdsson H, Sparks R S J, 1978. Rifting episode in North Iceland in 1874-1875 and the eruptions of Askja and Sveinagja. Bull Volcanol, 41: 149-167. Steinthorsson S, et al., 2002. Catalog of Active Volcanoes of the World - Iceland. Unpublished manuscript. Thordarson T, Hoskuldsson A, 2008. Postglacial eruptions in Iceland. Jokull, 58: 197-228. Remarks: A deep dyke intrusion at Upptyppingar in the Kverkfjoll volcanic system was likely ehanced by a retreating ice cap. Satellite radar and GPS data, and corresponding model results. a,b, Ascending track 230 spanning 27 June 2007 to 16 July 2008. c,d, Descending track 467 spanning 14 July 2007 to 28 June 2008. a and c show the observations with each colour fringe representing 28 mm of displacement toward the satellite. b and d show the modelled radar displacements together with horizontal GPS velocities, observed in black, with 95% confidence ellipses, and modelled in white. Also shown are the surface projections of the model source patches given in Fig. 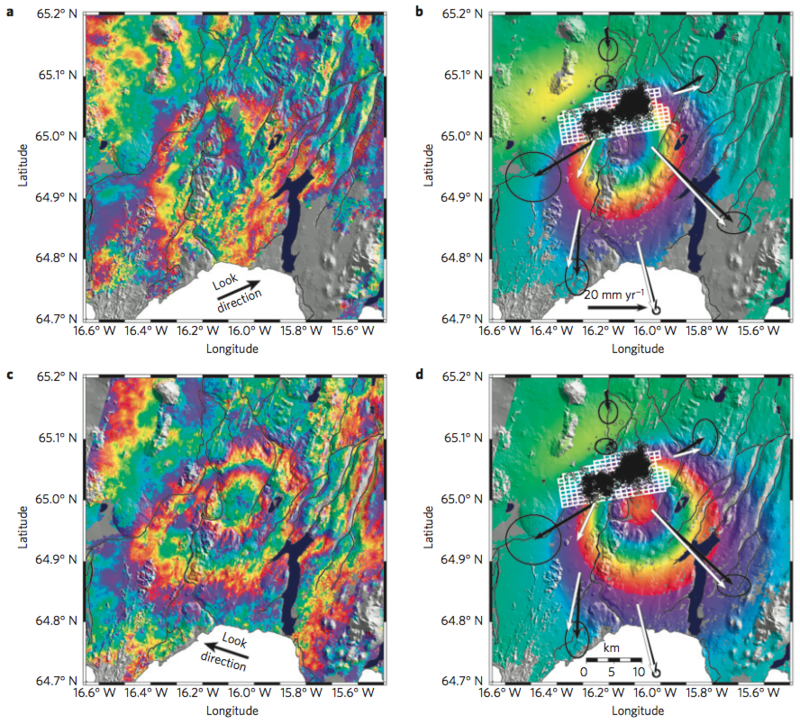 3 (white rectangles), and catalogue earthquake epicentres for the entire intrusion period27 (black circles). From: Hooper et al. 2011. Reference List: Hooper et al. 2011. There is no Emissions History data available for Kverkfjöll. Kverkfjöll, seen here from the north, is a large subglacial volcano at the NE end of the Vatnajökull icecap. 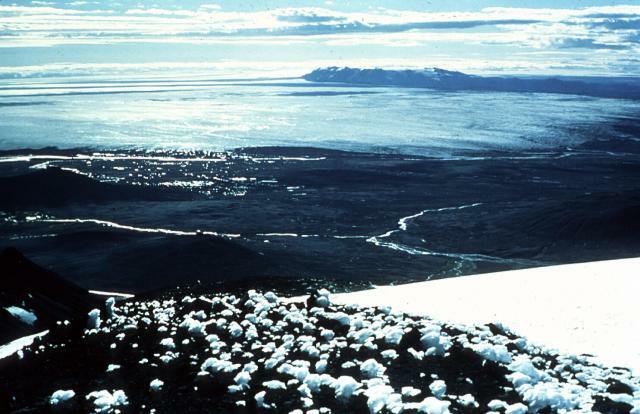 The Dyngjujökull glacier, an outflow sheet of the Vatnajökull icecap, appears in the foreground during a 1977 glacial surge. 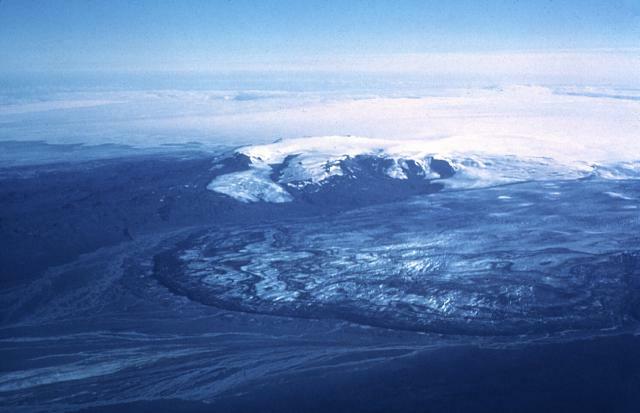 Two elliptical ice-filled calderas, 8 x 5 km in diameter, have been identified at Kverkfjöll volcano. An associated fissure swarm can be traced 60 km to the NE. Subglacial historical eruptions have been recorded since the mid-17th century. Photo by Oddur Sigurdsson, 1977 (Icelandic National Energy Authority). Kverkfjöll volcano (upper right) is seen here from Snæfell mountain, located to the ENE across the Bruarjökull glacier, an outflow sheet of the vast Vatnajökull icecap. A fissure system extends 60 km to the NE of Kverkfjöll, which is the northernmost of a half dozen volcanoes located on the Vatnajökull icecap. Photo by Oddur Sigurdsson, 1978 (Icelandic National Energy Authority). The Global Volcanism Program has no maps available for Kverkfjöll. There are no samples for Kverkfjöll in the Smithsonian's NMNH Department of Mineral Sciences Rock and Ore collection. Catalogue of Icelandic Volcanoes (Link to Kverkfjöll) The Catalogue of Icelandic Volcanoes is an interactive, web-based tool, containing information on volcanic systems that belong to the active volcanic zones of Iceland. It is a collaboration of the Icelandic Meteorological Office (the state volcano observatory), the Institute of Earth Sciences at the University of Iceland, and the Civil Protection Department of the National Commissioner of the Iceland Police, with contributions from a large number of specialists in Iceland and elsewhere. This official publication is intended to serve as an accurate and up-to-date source of information about active volcanoes in Iceland and their characteristics. The Catalogue forms a part of an integrated volcanic risk assessment project in Iceland GOSVÁ (commenced in 2012), as well as being part of the effort of FUTUREVOLC (2012-2016) on establishing an Icelandic volcano supersite. IRIS seismic stations/networks Incorporated Research Institutions for Seismology (IRIS) Data Services map showing the location of seismic stations from all available networks (permanent or temporary) within a radius of 0.18° (about 20 km at mid-latitudes) from the given location of Kverkfjöll. Users can customize a variety of filters and options in the left panel. Note that if there are no stations are known the map will default to show the entire world with a "No data matched request" error notice. Large Eruptions of Kverkfjöll Information about large Quaternary eruptions (VEI >= 4) is cataloged in the Large Magnitude Explosive Volcanic Eruptions (LaMEVE) database of the Volcano Global Risk Identification and Analysis Project (VOGRIPA).